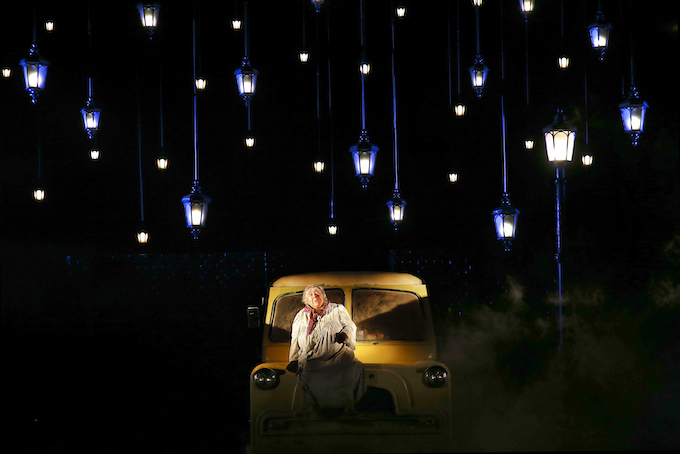 Bennett’s 1999 play has returned to the spotlight thanks to the well-received 2015 film, The Lady in the Van. This new production, directed by MTC Associate Director Dean Bryant, has a focus on model cars and automated staging, yet this technology is ultimately not enough to overcome the dated feel of the play’s leisurely pace and 1970s setting. Human relations are at the core of the work, and, despite strong individual performances, the connections have not been fully realised. The semi-autobiographical nature of the piece is clearly established by the fact that two of the three lead characters are Alan Bennett. Written as a memory play, one Bennett observes and chronicles the action while the other lives it. This whimsical device has its charms and yet skirts dangerously close to the fringes of self-indulgence. 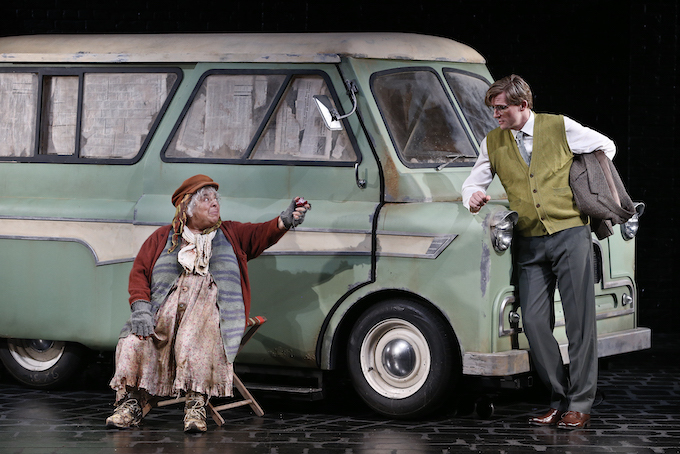 Known for most of the play as Miss Mary Shepherd, the lady in the van finds something of a good Samaritan in Bennett. Fast running out of legal places to park on the street, Shepherd prevails upon Bennett’s good will and parks her van in the author’s garden for an initial period of three months. Some fifteen years pass, during which time Shepherd’s obtuse deflections and spirited ravings mean that Bennett remains mostly in the dark about Shepherd’s backstory until after her death. While focusing on Shepherd, Bennett sets up a parallel thread chronicling the decline of his own mother. A mother-son bond has its own intrinsic connection that needs no explanation. In this production, Bennett’s introversion and reserve coupled with Shepherd’s relentless irrationality, irritability, lack of gratitude and smell mean that the reason Bennett allowed her to stay so long is difficult to discern. We are eventually told, in the protracted ending of the already lengthy play, that Bennett was affected by Shepherd, but we do not really see this. Designer Alicia Clements offers the simple backdrop of a black brick wall, with a very impressive collection of model and life-sized vans and other automobiles. Shepherd’s spiffy new van receives an entrance worthy of Priscilla. 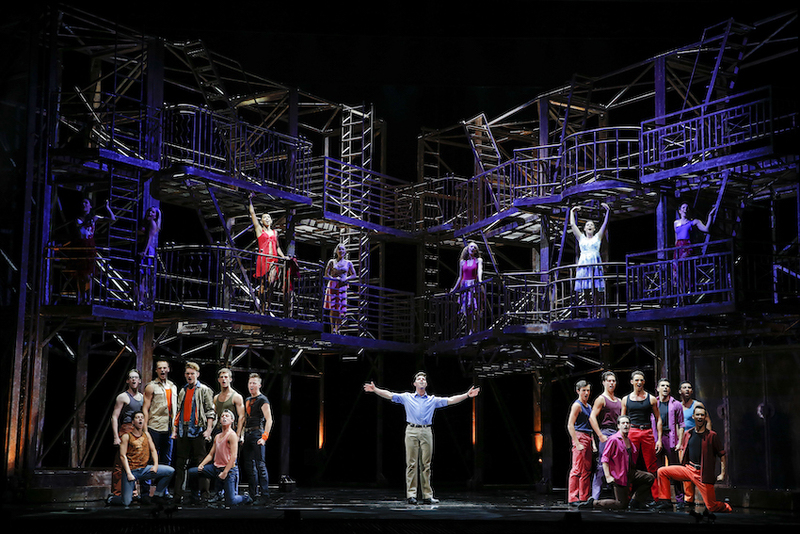 The play contains a particularly high number of scenes, each established by a door, a chair or a piece of fence. 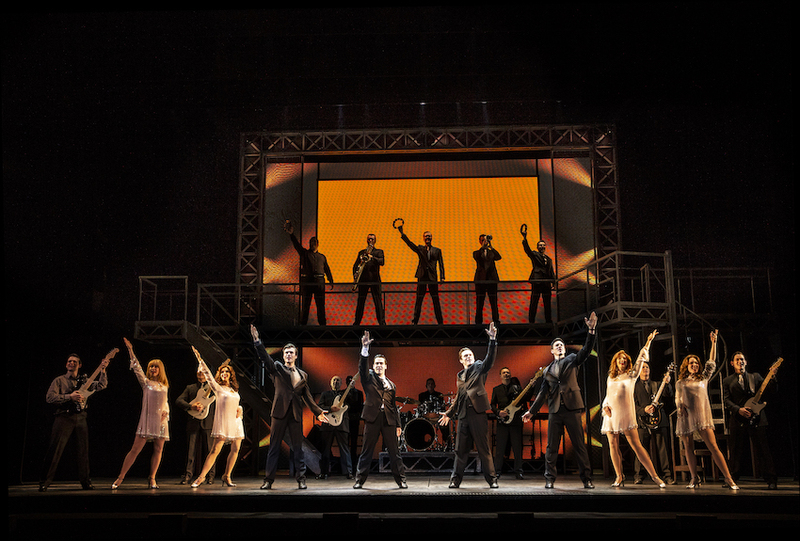 These glide on and off stage in a way that is clearly meant to be slick and yet becomes a little tedious due to the slow, slightly wobbly movement. Given that 15 years pass, Clements makes the odd decision to keep all of the supporting characters in the same costumes. Neighbours Pauline and Rufus look very fashionable for 1971 but then never change. Perhaps all of the costume budget was spent on Shepherd, who has an extraordinary number of costumes, making a change basically every time she steps on stage. Clements does not shy away from Shepherd’s dirty appearance, giving her all manner of foul stains as part of an overall look in which the poor woman’s smell can almost be seen physically emanating from her. Part of Shepherd’s backstory involves her time as a talented pianist, and this is brought to life through composer Mathew Frank’s lovely musical score for the play. Margolyes’ performance is a wonder to behold. 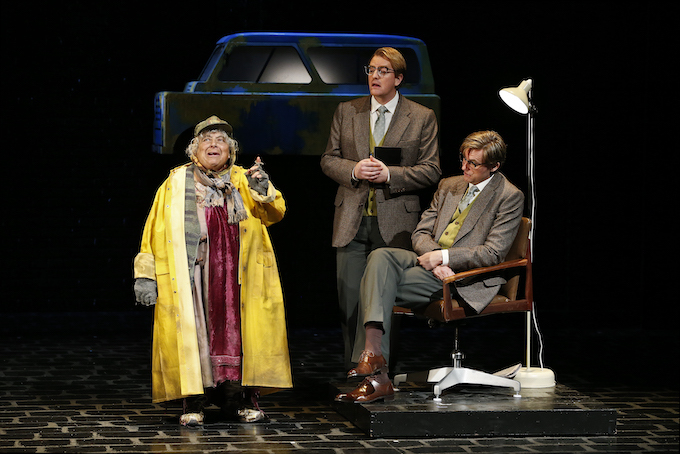 In the 150 minute running time (including interval), Margolyes is rarely off the stage (and when she is offstage, her absence is keenly felt). Mention must be made of the fact that that we rely on theatre to eschew the ageism of Hollywood and give a real woman such a wonderful leading role. Margolyes doles out Shepherd’s schemes and dreams with abandon, while cannily keeping the woman’s secrets close to her chest. Margolyes does not cut corners by making Shepherd a loveable old dear; rather, she tenaciously holds to Shepherd’s manic fantasy world, upholding the mystery of what gave the woman such sway over Bennett and others. 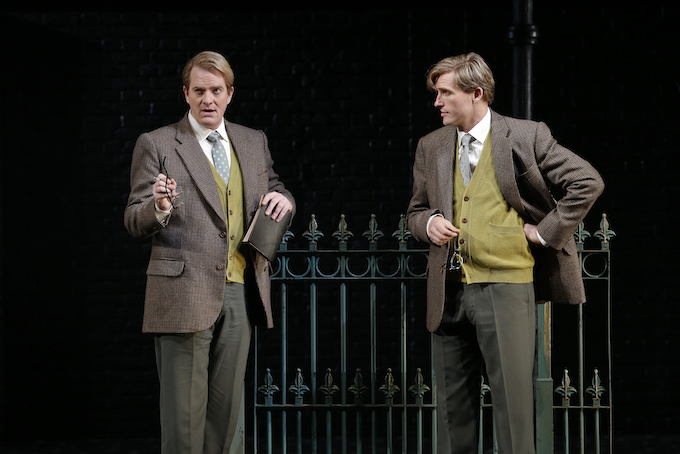 Daniel Frederiksen and James Millar are very well matched as the two Alan Bennetts. The connection between the writer (Millar) and protagonist (Frederiksen) has an easy, natural feel; it is frustrating that the relationship between Bennett and Shepherd did not reach the same level of chemistry. Fiona Choi and Dalip Sondhi bring a cheery energy to their limited material as neighbouring couple Pauline and Rufus, who are there to bring a touch of zeitgeist beyond Bennett’s sheltered world. Claire Healy captures the well-meaning patronisation of the Social Worker. Jillian Murray is sweetly vulnerable as Bennett’s Mam. Stalwart actor Richard Piper is ever invaluable, bringing a distinct characterisation to each of a range of roles. 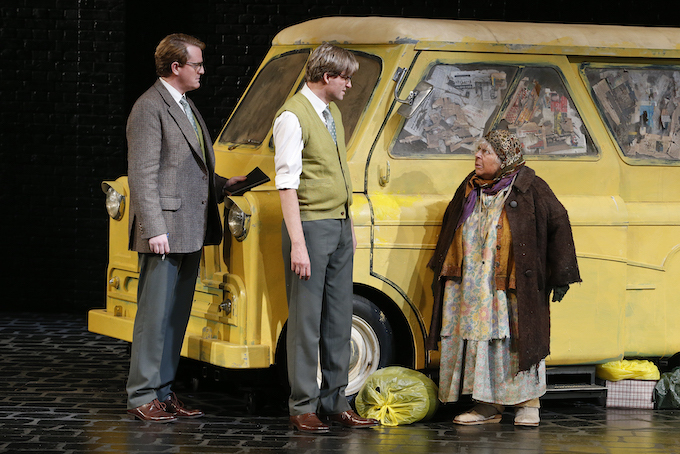 The Lady in the Van is a solid example of MTC’s ability to present a large scale production as part of a busy season. Aficionados of Margolyes will appreciate the chance to see her in such a significant role. 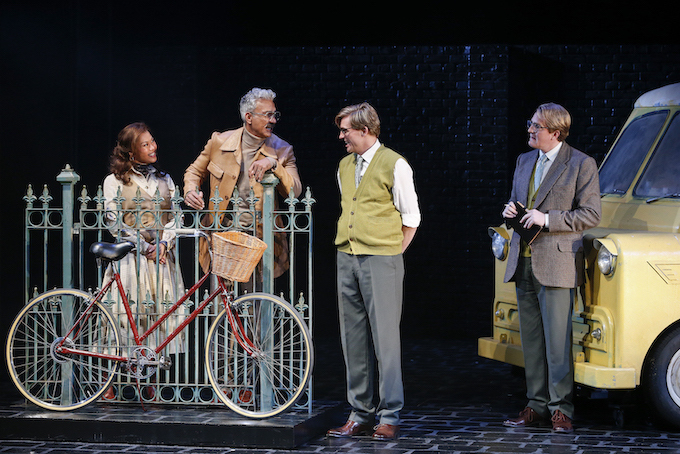 The Lady in the Van plays at Playhouse, Arts Centre Melbourne until 9 March 2019. Thoughts the neighbours were awful! Loved Margoyles!